We are excited to announce the Men’s 2019 Opening Day Tournament! Some new things are happening this year that you will be happy to know. The MGC tournament fees will be dropped from the original $35 to $30 per entry. 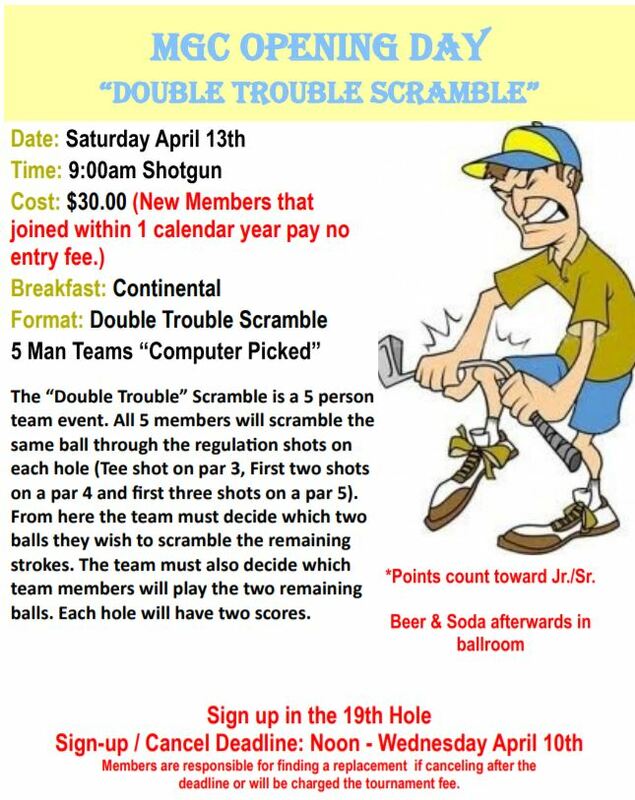 Included with this new entry fee will be range balls, continental breakfast, post-round beverages and higher prize payouts. The snack bar kitchen will be open for business during the morning and after the tournaments for anyone interested in a breakfast sandwich or lunch. Please note that this event is dedicated to the “new members” of Bon Air. To give a nice warm welcome, we are extending a free entry to anyone who has joined within the last year and is participating in their first MGC event. We are now accepting Sign-ups, please call the Pro Shop or swing by the club and visit the Men’s Lounge where you will find all the current MGC event fliers.